First off here we probably ought to say a little bit about trademarks and patents. When I say 'soundfield' I mean soundfield with a small s and when I say "Soundfield (tm)" I'm refering to the Soundfield (tm) company who produce the exceptionally high quality Soundfield (tm) microphone and control unit. All of the design data described in this article is freely available in published papers.I believe the tetrahedral array has a Michael Gerzon patent. A three-dimensional surround sound Ambisonic recording can be captured using a tetrahedrally arranged quartet of cardioid pattern microphone capsules connected to some simple circuitry to convert the outputs to a standard B-format signal. B-format signals represent a 3D soundfield with four signals; X,Y and Z representing three orthogonal figure of eight patterns and an omnidirectional W reference signal. The commercially available product is very "high-end" in both quality and price. This article describes a lower quality but much cheaper version for experimentation. For more info, try a search for ambisonics; There is a good page at the university of York. UHJ in this instance is a stereo compatible phase matrixed method of cramming horizontal surround only B-format W, X and Y signals into 2 stereo channels. This can be decoded back into B-format W, X and Y for playback into a B-format to speaker feed decoder. The most basic requirement for the project is for some cheap, fair quality cardioid pattern microphone capsules which must be physically small in size. The first attempt at this microphone used 6mm diameter capsules made by Horn in China which I bought from Mouser in the USA under code #252-EM6050U-514. EMU6050U is the Horn part code. These were just too noisy even for a cheap microphone.The second attempt uses Panasonic WM-56A103. These are 9.5mm modules which have higher output and a much better S/N ratio. The performance is hardly professional but reaches a level which I think could have real practical uses. The Horn mics claim similar noise performance to the Panasonic mics and better low end frequency response. You only have to listen to hear that this simply isn't true. The Panasonic WM-55A103 is the back electret close relative of the 56A which I also bought 10 of, as I was puzzled as to why they were more expensive when the others had a seemingly better headline specification. I've been told since that this is a higher quality unit than the foil electret, so potential constructors may choose to go for the WM-55A103 instead. The difference between the two is obscured by the idealised frequency response chart on the data sheet. The circuitry overall runs from +/-9V battery supplies. The system will continue working normally right down to 6V rails with reduced headroom, so can be run from two 8.4V nickel rechargeable PP3 batteries, or can take 9V alkaline batteries down to almost full discharge. The mic bias voltage comes direct from the +BAT supply and this is filtered heavily with the 2K2 -100uF combination. Any noise on this bias supply will appear along with the microphone signal so it has to be quiet. As the batteries discharge there will be a gradual and slight gain reduction but I consider this to be preferable to running the mic bias and pre-amp stages from regulated supplies, as they have to be quite low voltage to avoid going into dropout. Absence of regulators also saves battery current. The input noise of the TL074 and other common op-amps is too high to be used directly as a microphone pre-amp, I tried it. So the circuit shown uses a simple discrete transistor differential amplifier connected to an op-amp with feedback. This gives low noise from using good quality cheap discrete transistors configured to provide some gain, and good linearity provided by the high open-loop gain of the op-amp with overall feedback. 2N4403 transistors are used running at 250uA collector current. That is about the right point for best noise performance with 600Ohm to 2K Ohm input impedance. This is similar to pre-amplifiers used in some moving-coil phono cartridge input stages. You can hear that the microphone capsule noise dominates the input stage by replacing it with a 2K2 resistor and hearing a distinct drop in noise level. The first stages provide 21dB gain for each capsule, and there are trims on each amplifier to accommodate different sensitivity between capsules. For more info on pre-amps look at the Doug Self amplifier web-page or buy his interesting book. The following stages provide further gain and convert the capsule outputs into standard Ambisonic B-format. The equations for this are available from various standard references but suffice to say that the circuit creates the following signals. Where LFU, LBD, RBU, RFD are the signals from the cardioid pattern capsules facing the directions Left Front Up, Left Back Down, Right Back Up, and Right Front Down in the tetrahedral array and 2.83 is 2*root2. There is an overall inversion in this stage, as there is also in the pre-amp stage. This cancels overall. 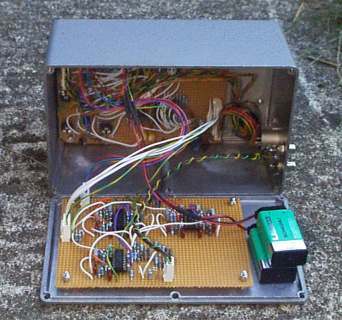 In the dim and distant past a battery powered prototype soundfield microphone control box had a UHJ encoder included. What a great idea! Well with this design you can also record on location direct to UHJ with your stereo minidisc recorder, or even your dusty old cassette Pro-Walkman. This is ideal for capturing live events where you're not intending to do any further mixing on the result, and is in keeping with the inexpensive ethic of this design. So here we have a built-in UHJ encoder for interfacing to standard stereo recorders which are extremely commonplace. The UHJ converter is built on a separate board from the A to B format converter. The B format signal enters on a 5-way Molex connector and goes to the phase shifters. These are based on what I think are original Gerzon paper time constants, but I'm not sure of the source as I only have a fragment of the full document. The circuit is simple and doesn't use the strange capacitor values found in the Audio and Design UHJ transcoder and decoder. I buy a bunch of good quality capacitors and measure the capacitance with my cheapie old multimeter which can just about manage 1% precision. Generally I can find plenty within 1% out of a bunch of 20 units and this is much cheaper than buying 1% versions. This is close enough for me. If I can't find enough within 1% then I change the resistor value in the time constant to compensate, which is what I've done in the real circuit. The filters are 8 pole and cover 30 to 16kHz with +/-1.3degrees error assuming perfect components. In real life +/-2% is probably closer to reality but this should still provide very good operation. The UHJ encoding equations require relative 0 and 90 degree versions of W and X signals and just a relative 0 degrees for Y. After the phase shifters the signals are summed according to the equations below where the j means you take the output from the 90 degree shifter. Now for a mildly interesting point. Creating weighted signal sums into the inverting terminal of an op-amp with feedback is simple; The ratio of the reciprocal of the input resistors simply represents the relative gain that the signals into those particular resistors will get. The situation on the non-inverting side of the amplifier is a bit more complicated, because the +ve terminal is not a virtual GND. When you add another input resistor on the +ve side you change the gain of all the other inputs on the +ve side. You can, of course just sum the signals requiring a +ve polarity into the -ve terminal of another amplifier and then feed that into your -ve sum. But that wastes an amplifier. As long as you don't want more than two inputs to the non-inverting side it is relatively easy to work out the resistor values if you remember that the non-inverting gain is first set by the feedback resistor and the combined input impedance of all the other inputs on the inverting side. You work out the normal +G = 1+Ra/Rb to find the non-inverting gain which will always be >1. Then,... well it gets slightly more complicated and though I did the maths for the real values I haven't worked out a general case yet. Suffice to say I saved two op-amps with a bit of calculation, and the values in the schematics really are correct. The maths gets worse with more inputs on the non-inverting side, so here I put the more populous signals with an equation + in front into the -ve side and the sparser signals in the equations with a - in front into the +ve side. The result is just an overall signal inversion in both channels which is irrelevant. In the picture below the A to B format converter is attached inside the box and the UHJ converter is attached to the lid. 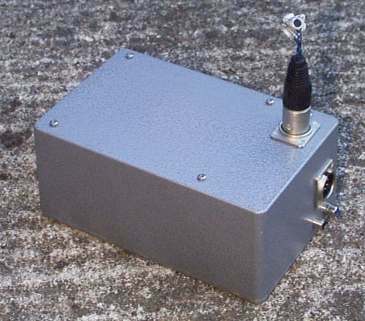 The picture below shows the completed pre-amp box with the microphone array plugged directly into it. The photograph at the top of the page shows the microphone array. The tetrahedron was made from soldered together equal length bits of heavy gauge tinned copper wire. This is a tricky process but the surface tension of the solder blobs at the corners helps a little. The faces of the tetrahedron are sized so that the 9.5mm diameter mic capsules will just drop through them. 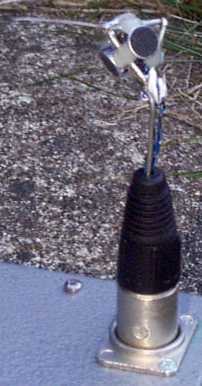 The mic capsules are held in the faces of the wire tetrahedron with blobs of epoxy as seen in the top photograph. The other photgraphs of the whole box and mic array show the older smaller Horn mic capsules held in with paper. The electrical connections to the mics are made with twisted together fine gauge kapton covered wire, and the array is supported by a thick gauge copper wire soldered to the array and the other end to the GND pin in a five pin XLR. This XLR plug forms the main supporting mechanics, and the mic can be hand-held by the plug mated with an in-line socket, or by plugging it directly into the socket on the pre-amp box. The fine wire pointing out to the left in the photograph indicates the horizontal front direction. I was about 1.5m from the mic while doing this so the noise level isn't too bad. You could use this for high level recordings of a band, but for low level sounds the signal/noise would be too poor. I had to mp3 the file but it's only compressed at 320kbits/s, and the UHJ encoding seems to survive very well. Thanks is due to those on the surround sound mailing list who have spotted typographical errors and corrected some misconceptions, as well as providing measured data for the WM-55 mic capsules and potential sources of higher quality capsules. Since 2003 I've done a bit more reading about this. The clearest information that I found on the subject was a scanned copy of some 1970s internal design notes concerning the original Soundfield design, I think by Michael Gerzon. This was entitled something like "Why you really do need non-coincidence compensation," and had hand plotted frequency response curves to back it up. My statement above stands, due to the small diameter and because I stated 8kHz. as a maximum frequency, but it's perhaps a bit dismissive. I ought to have ensured that the overall frequency response of the system was less than 8kHz. if I was going to be that sweeping. The problem for me was in the name. If it had been called "non-coincidence frequency response compensation" I might have looked a bit deeper. What happens is that the frequency response of the mic as a whole is different in W than it is for X,Y and Z due to the capsule separation. Obviously, in each of those outputs it should be the same. From memory, when the A format feeds are just summed/differenced in the correct ratios to make B-format, the frequency response of X,Y and Z changes relative to W when the capsule separation becomes a significant fraction of the wavelength. This isn't by a trivial amount either, and it can reach 12dB. So, if the capsules get bigger and the separation rises the frequency at which this matters drops and big errors can arise. That's not just some esoteric degradation of the surround accuracy; It's a matter of the relative frequency responses of the B-format signals going badly wrong. So, if you're making a coincident microphone to create B-format and don't want to be crucified by the academics, you will want to consider this. I'm sorry but I can't currently help with links to the design information mentioned above, as I was stuck in a factory on a laptop when I found it and haven't managed to find it since. Analogue implementations are certainly possible, but I think that the real signal delays available in DSP make the job much easier in digital based A to B conversion. An engineer from the USA recently found that the input stages in this design could oscillate under the conditions in his system. True, the TL07x can get a bit lively dependant on the load, so in audio applications it's best to add a low value capacitor between the output and the non-inverting input of most instances of those amplifiers, say 15pF. 20-OCT-2003 Complete and tested functionally, published to web. 24-OCT-2003: Corrections made to schematic ms01-01.sch where the connections of C11 and C12 met the wrong bus dropper. Clarification about the prototype nature of the old battery product with built in UHJ encoder.Comments about the back electret WM55A-103 capsule added. 20-MAY-2009: Added a footnote about non-coincidence compensation and input op-amp taming.